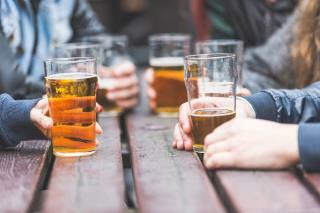 (Newser) – Two teachers and a superintendent's secretary have resigned after video surfaced of them playing a game of "F***, Marry, Kill" involving coworkers and students last month at a bar in Michigan, Fox 17 reports. Some of the students named during the game have special needs. According to WOOD, the video was posted to YouTube on Monday and was addressed during a heated school board meeting that night. The three Bangor Public Schools employees who resigned could be heard making inappropriate comments in the video. Four other teachers present in the video were reprimanded by the school district. I don't see the problem. It teaches logic operations. You have a 3-element xnor gate with output phase trigger with any number of subroutines. Now to make it really fun, how about F,M,K,E,S,H. Own your own bar and no filming. Derp. The question is, did they know they were being filmed and posted on social media? To do so knowingly would be blatantly stupid. Maybe the game was a little off color, but no one would have been hurt by it except that someone posted the activity online. The story mentions special needs children. I dated a special needs teacher once, and was shocked at some of the things he said about his students. When I asked him about it, I came to realize that he had to joke about about it because otherwise it was all just too overwhelming. People need to mind their own business and quit trying to police the world via social media.